Current Position: 16 12.1 N 061 29.6 W Click to view map. A bit of an update. . 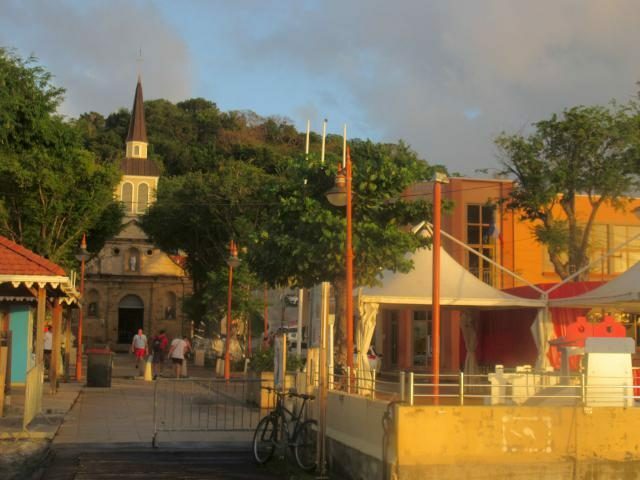 It was fun to visit once again some of our favourite spots in St Lucia and Martinique. After some maintenance and home improvements along the way, we were happy to go explore new places. 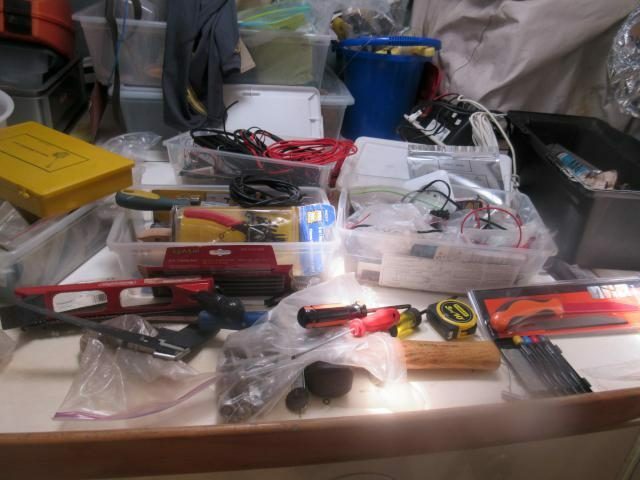 One table full of wires and all kinds of electronics. Looking for instructions. Thanks Google. 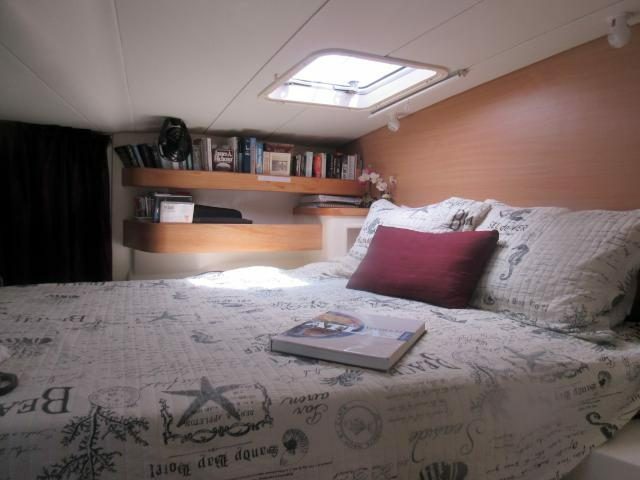 Another cabin was full of binders spread out with manuals for every part in this boat. Pictures missing because, Noel did something to the sim card on the phone, he forgot I had pictures in it. Sewing was part of my job in between beeing his assistant when he needed the wires being pulled and tucked under very difficult areas. Thank goodness after a good swim I could still find MY safe areas he is not allowed to bring the mess. We left St Lucia to Martinique. Hopping up the coast and staging ourselves to depart to our destination: Guadaloupe. We left after lunch, with a nice sunny afternoon and 18kts of wind. We put 3 fishing lines out and got tired of cleaning weed off the lures. We were just about to give up, it was sunset and about to arrive at our anchorage, when we caught a really nice mahi mahi. What a surprise, with all this sargassum weed. This fish is so tasty! I put away my stew that was going to be dinner, and voila! fresh mahi mahi instead. In the mean time we had the beautiful Adele classic yacht, pass near us with full sails up What a beauty! We anchored in the nice small town, Grand Anse in St Lucia for the night and she was anchored just behind us as well. We left to Martinique. Not much wind in the lee of the island but it filled in a bit later and we were doing a nice 7kts average. Anchored in St Pierre for the night. In the morning it was so nice and peaceful there we decided to spend the day and get started on our kitchen floors. We had found these nice vinyl tiles in Fort de France, and thought they would be perfect to replace our tired looking floors we have. Of course one day was not enough and we wanted to see the full results so we stayed 2 days instead to finished it. It takes a long time to put down , because of the many cuts in confined areas. I had to crawl into the locker and lay there to unscrew the legs from the coffee table we had to remove. We are very happy with the results. Hard work and messy but worth it. Gotta keep up with the Joneses, so that means maintenance and home improvements in exotic places. We need 2 more days to do the starboard side now, but no rush! We woke at 3:30 (alarm was supposed to go off at only 5 am) and thought why not leave now? it will definitely give us a nice early arrival in Guadaloupe. What a beautiful morning. With calm and smooth waters along the lee of the island we enjoyed the sky just covered with stars and many constellations. As we got into the open sea up the Dominica channel, the waves did get a bit big, but not too bad just, long swells. Wind 18 to 22 kts close hauled. Sad to say we did not catch any fish. Too much weed again. We do not remember this problem in the Caribbean 7 years ago, but now it seems to be everywhere. In fact, later on someone told us that even 3 years ago there was no weed. They had heard that it had something to do with the deforestation in Brazil. Who knows? 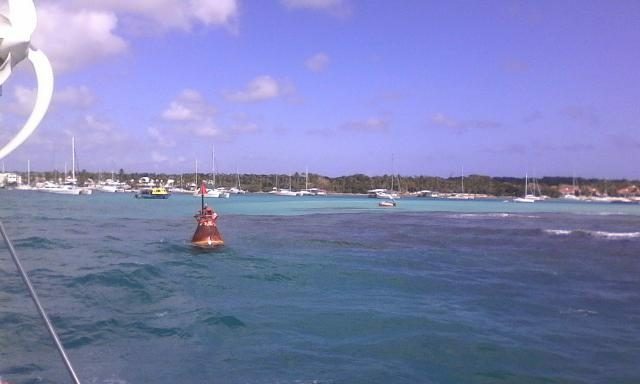 At 2pm we anchored in Grand Bourg, the biggest town in Marie Galante, French island, and part of Guadaloupe. It was quite rolly there so we weighed anchor and moved a bit up the coast to the next small sleepy town of St Louis. That was a busy anchorage and very calm. Good dinghy dock and a really cosy cafe with good Wifi. The next day we tried to check in, but there was no place to do it. We took the bus to Grand Bourg and they were closed, its Saturday! Pa ni pwoblem, as the they say in French Creole, they are very laid back about checking in and out here in France. We took a long walk along the beautiful town beach and part on a main road to get to touristic site of an old sugar mill and estate. At one time they housed up to 300 slaves. Interesting place with a nice museum, park like setting and a nice walk. 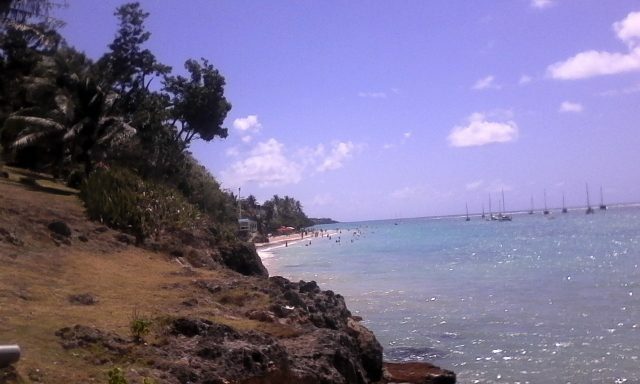 Marie Galant is a nice quiet laid-back island, very small but yet a few nice beaches and walks to explore. 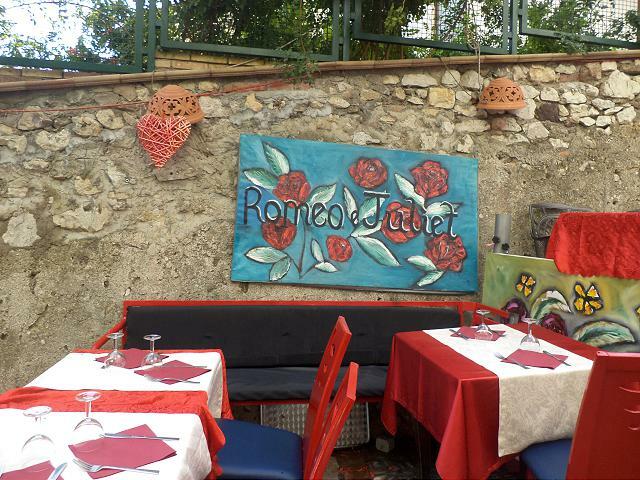 We enjoyed that and stayed for 2 days. No photos from here because we switched sim cards on the phone when buying internet and Noel erased all, forgetting I had pictures in it. Normally, I use my camera, but left the battery in Canada. 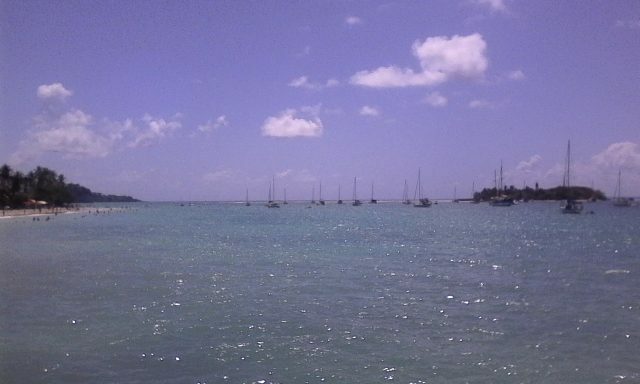 Had a nice 17 Nautical miles sail to the main island of Guadaloupe, and anchored in the nice town of St Francois. And this is why we like to makes sure to arrive at a new destination in daylight. 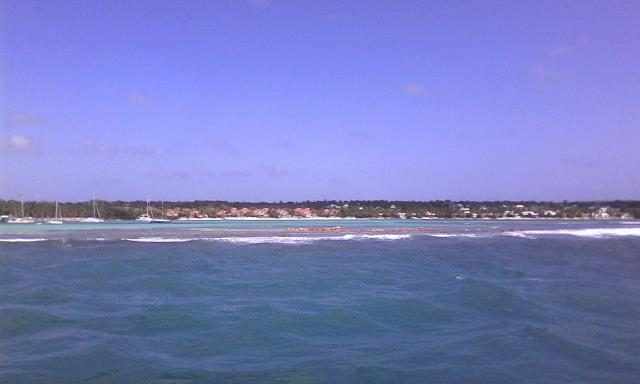 The reefs extend way out, and you are coming in with lots of wind and waves in different directions. To add to the excitement in the channel you have to figure out from afar if this rusty thing is a buoy that needs a coat of red paint or what?? After anchoring ahead, we took the dinghy to the Marina. The check in, at the Capitanerie was an easy 10 minutes. Free of charge, instead of the usual 5 euros, so we gave it as a donation to the Search and Rescue fund instead. 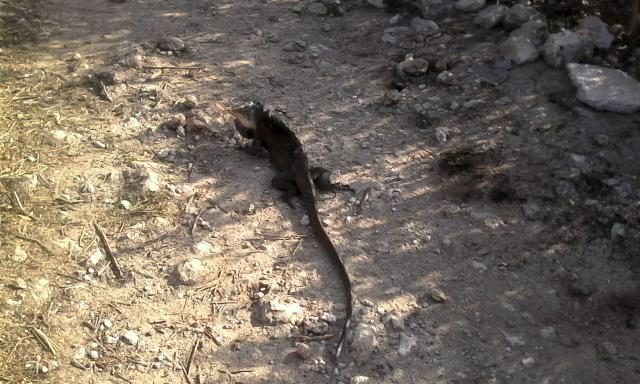 Next, we did the usual running around to buy internet, sim card. Nice Marina lined with many shops and Restaurants. Behind it you find many places for car rentals and many stall selling you day trips to the islands of Petite Terre and Desirade. 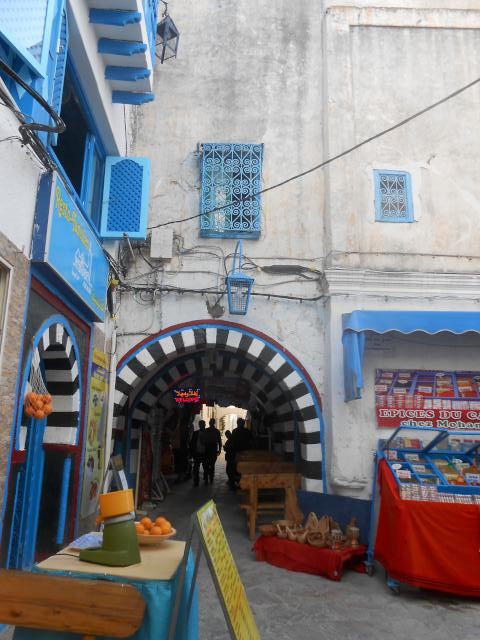 All amenities are within walking distance, including the market with nice fruit and veggies and also the fish market where one can buy the fish off the fishermen in the morning. Right here by the Fish Market is also the Bus station, that is always good to know. We were on a hunt for the usual upon arriving in a new place. internet, sim card. Success with Orange. 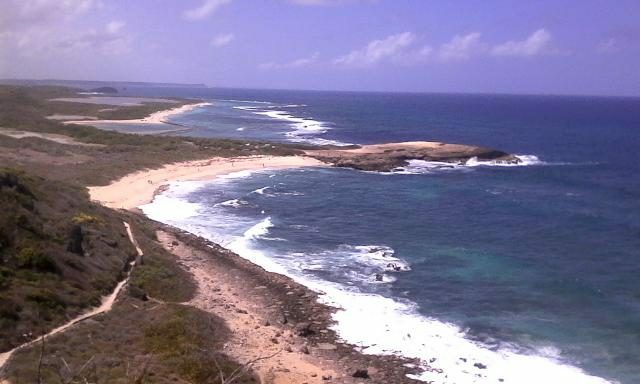 Took a short bus ride, about 10 km to this really nice peninsula called Pointe des Chateaux. Didn’t realize till we got there how busy and popular and touristic it is. Buses unloading and picking up tourists, souvenirs stalls and a yummy, delicious stand of coconut sorbet. 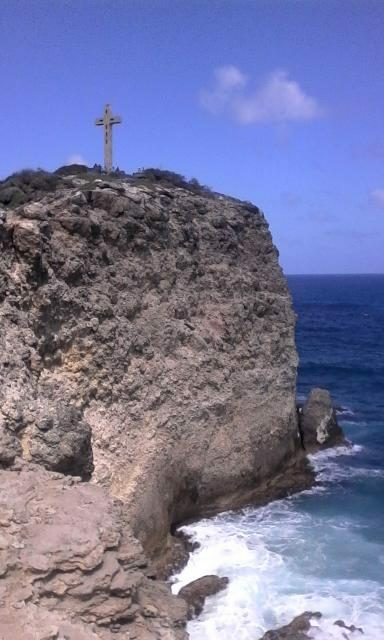 This amazing limestone peninsula is a natural historical and agricultural reserve. Besides having nice beaches,most of them protected by the reefs, it has hiking trails and a view point, and more than 200 species of plants and many species of migratory and nesting birds. 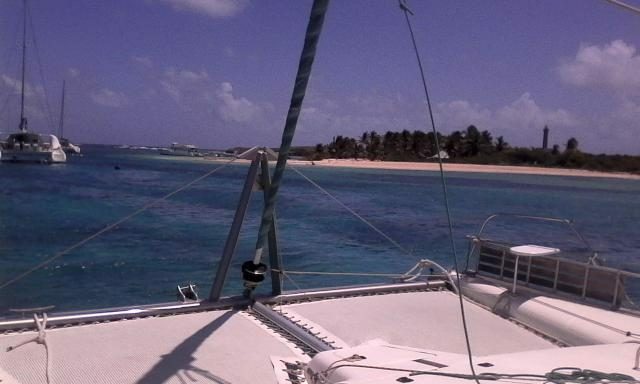 At 10 am we decided to leave our anchorage in St Francois and sail along to Sainte Anne. 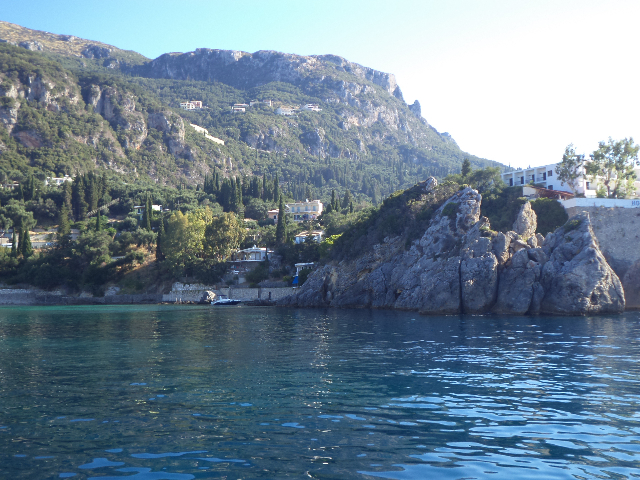 Picturesque coast with small cliffs and very nice beaches. Once we were out of the anchorage, however, we realised the waves were actually not so bad. 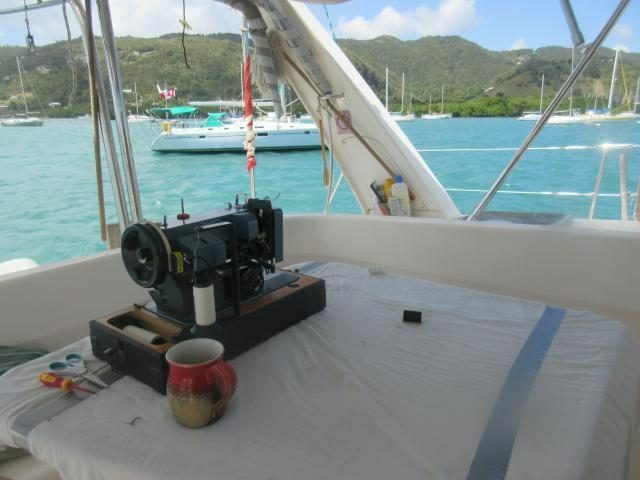 So we decided to motor for three hours dead upwind to the two tiny islands that make up Petite Terre. Here we are, arriving in this paradise . 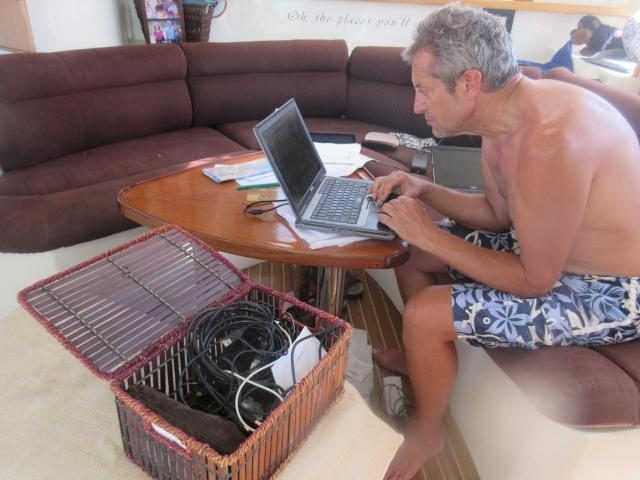 I am hurrying to take this picture before the captain starts to tell me to find a mooring ball and watch our depths!! 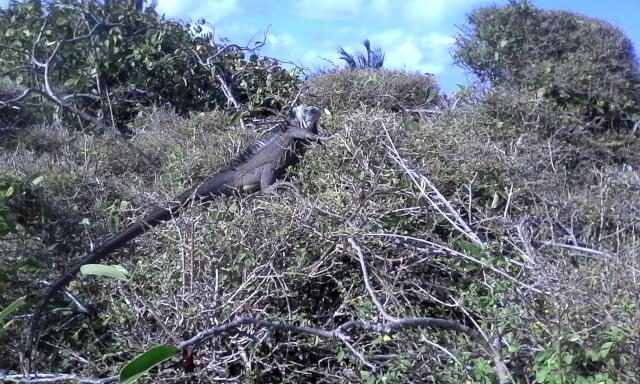 This is a nature reserve with abundant iguanas ashore, and stingrays and many other fish in the water. There is a bar to cross to get into the anchorage, which is exciting when there are breaking waves over it, but it turned out to be straight forward. We just line up for the deepest part, motored fast against the current, and so we were in. Once inside we were greeted by Nick, of Ventus, whom me had met in Marie Galante. He grabbed our lines, passed them through the loop on the buoy, and passed them back up to us. Now that is the easy way to tie up to a mooring! It is a popular destination for day cruises, both on huge sailing catamarans, and also motor speedboats. So during the day the moorings are all taken up. But they leave by 4pm, and then the place is all ours . What a beautiful place to wake up in the mornings! 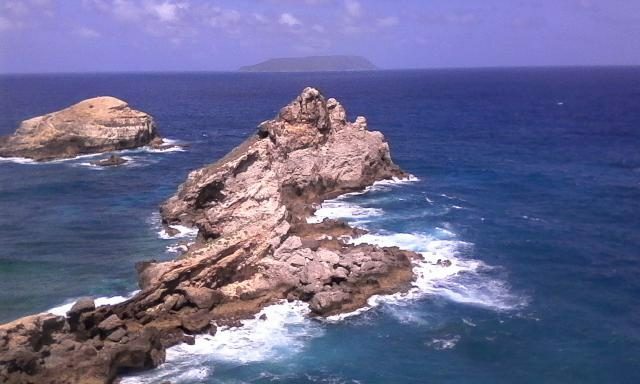 between 2 deserted islands. 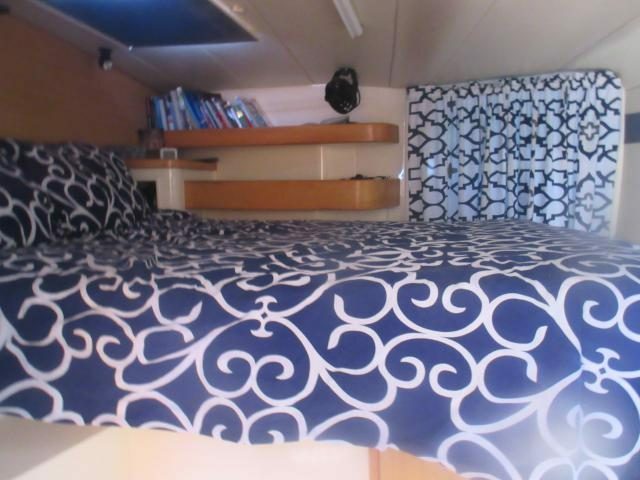 This one on our port side no one is allowed to go ashore. And under our boat there were huge tunas, 2 rays and a turtle. One evening we had a big barbecue on shore, above photo, along with Nick, Jessica and their three children, plus Stephane and Laura plus their three children. American flag and Swiss flag. The kids had a great time, and made smores that they shared with us. Haven’t had those in years! Beer was drunk, food eaten, and conversation made. 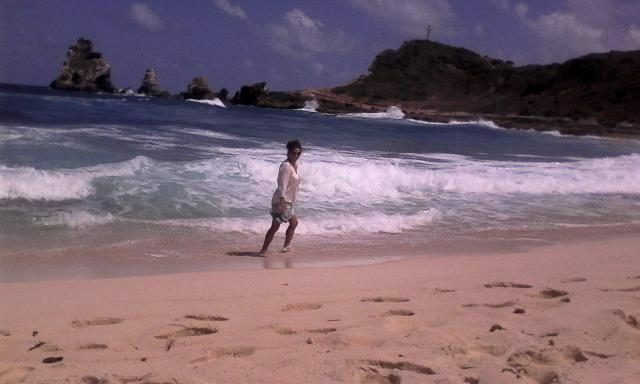 A good time in our own private island!! We did, of course, do lots of snorkeling. Such a shame that one is fighting through the floating sargassum weed all the time. Definitely wasn’t like that in 2010. And all the coral was dead. But there were some good sized fish. We swam with turtles, stingrays, tuna, grouper, surgeon fish, sand tile fish, blue tang, sergeant majors, angel fish and even a group of three squid. Many others that we recognised but couldn’t name. We also saw a small lemon shark swimming along near shore, as we were walking on the beach. 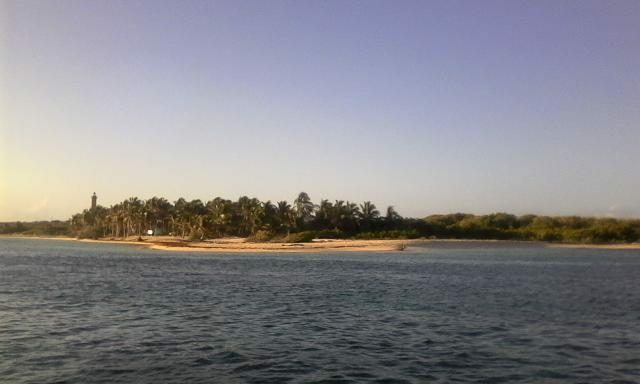 Friday 16th March, we upped anchor and headed, once again, for Sainte Anne. Of course that meant crossing the bar again, which seemed to be even bigger waves than on the entry. We watched Ventus leave before us, and they smashed through half a dozen breaking waves, their boat pitching up and down like crazy. But with some good timing we found a pause between waves, and only smashed through on breaking wave – which gave us a good soaking. And so we were on our way in sunshine, with a 10kt following wind, making for a very smooth crossing. The fishing lines are out, and we are busy catching lots of weed again. All part of the fun. Headed for Sainte Anne. On this coast the attraction is the beaches. 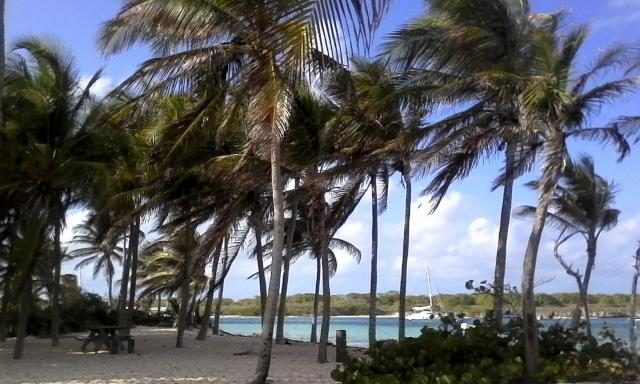 Lined with palm trees,turquoise shallow waters protected by the reefs and good snorkelling. The small town is filled with vendors, souvenirs, restaurants,water sports and all that kinda stuff geared for tourists. Club Med is here too. We stayed one night here, it was quite rolly. Got together in the evening with the other 2 boats at Ventus, hosts Jessica and Nick, for some drinks and Mexican train game. During the day is busy with tourists coming in and out by water taxi, but by evening is very nice and peaceful again. We had a nice little walk there to the lighthouse at sunset. As we approached the anchorage, it was nice to see 2 boats we previously met in St Lucia and paid a little visit. They gave us a tour of their beautiful new Lagoon 450. 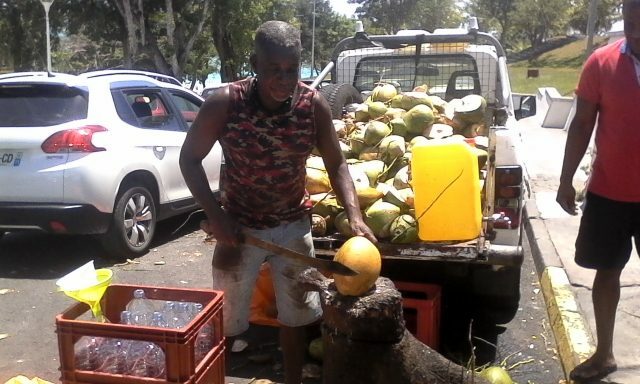 This morning I went ashore and picked up some delicious coconut water from the locals. We love it! Today is Sunday and most places are closed. Time to do some work! I had most of this post ready just had to upload a couple of the last photos. Busy working on our flooring today. Drinks tonight at the Canadian boat, Leanne and Andrew from Sunshine coast, together with an American boat. 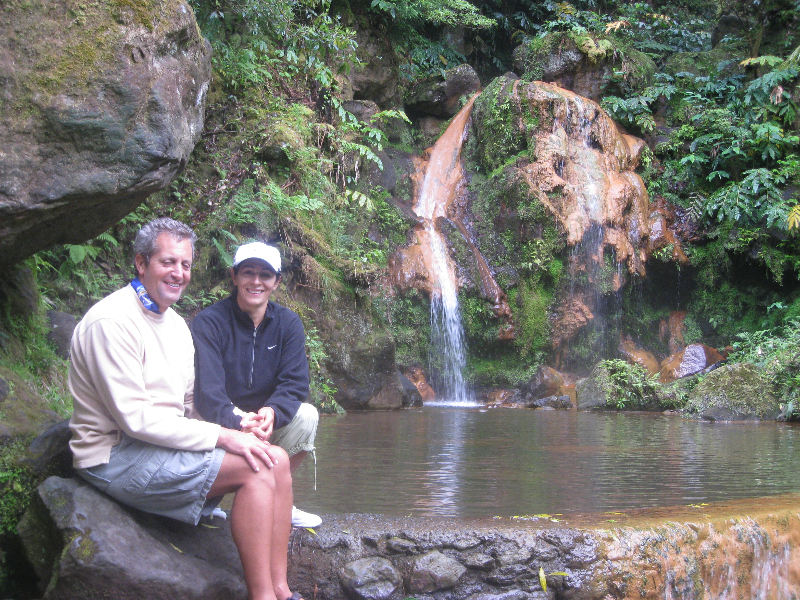 Staying another week here in Guadaloupe, looking forward to do some hikes and explore some waterfalls. Headed to Antigua end of the month. I have been without a computer since I last wrote but I think about you guys often. Thank you for remembering me to Heidi – it made me feel great that she still remembered us playing Upwords in Coldstream Meadows. I have to send her an email now that I am up and running. I read your last posting with the lovely pictures of Guadaloupe and area. 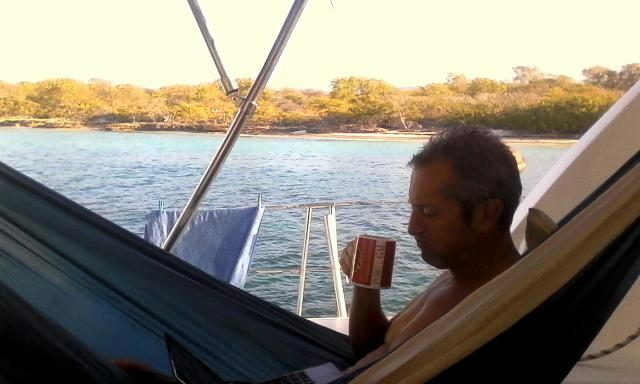 The best shot was of Noel drinking coffee in the morning in what looks like a hammock – perfect living!! You guys are so lucky …. I am hanging onto your shirt strings cause I feel so lucky just to know someone who is living the life you guys live. It seems impossible that it is already the end of March. Spent last night eating Asian/Chinese food and pigging out on cake – it was my daughters 47 birthday and we sure celebrated! I don’t know when she got so old . . . .
We had a couple of days of downpour and high winds but did it ever take away a lot of that ugly dirty snow that has been hounding us all spring. I don’t mind the snow in winter but after February I am so done. That’s all I have for now folks. Glad you are both well and happy and that your ankle healed okay.